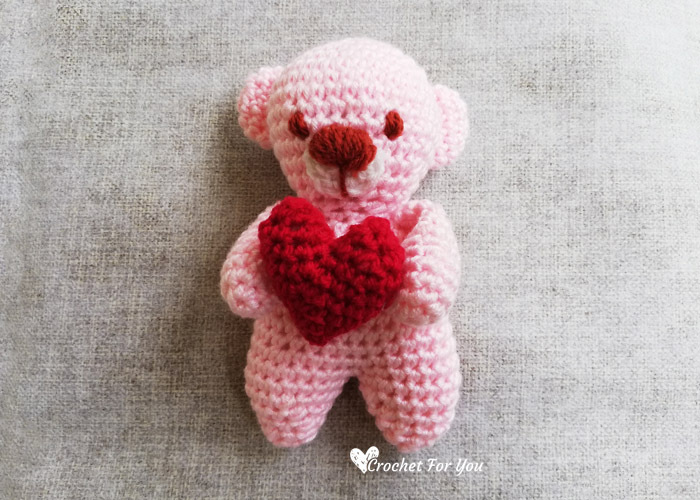 Valentine Bear Crochet Pattern by Crochet For You. Here is a last minute gift for valentines day. 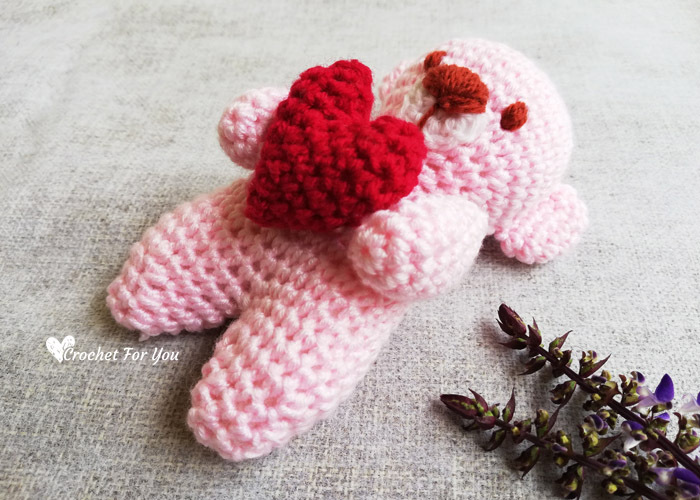 Please welcome crochet valentines bear!. 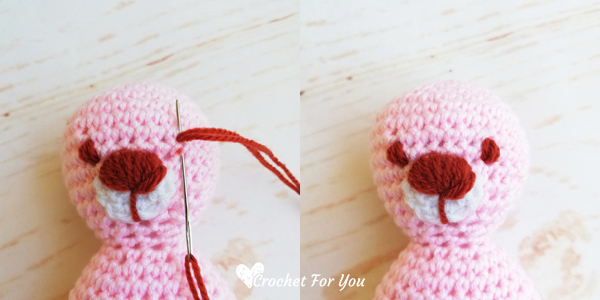 😀 Isn’t he too cute to crochet? He is holding a little red heart to show how much he loves you. This Valentine bear is very special to me, too. 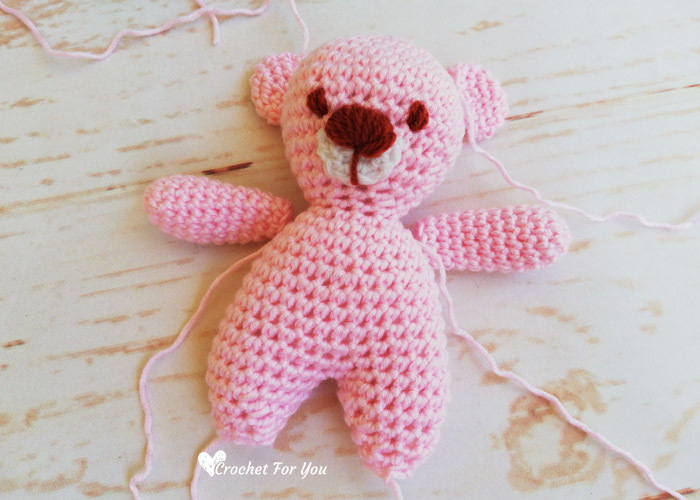 It is the first perfect amigurumi pattern I made. 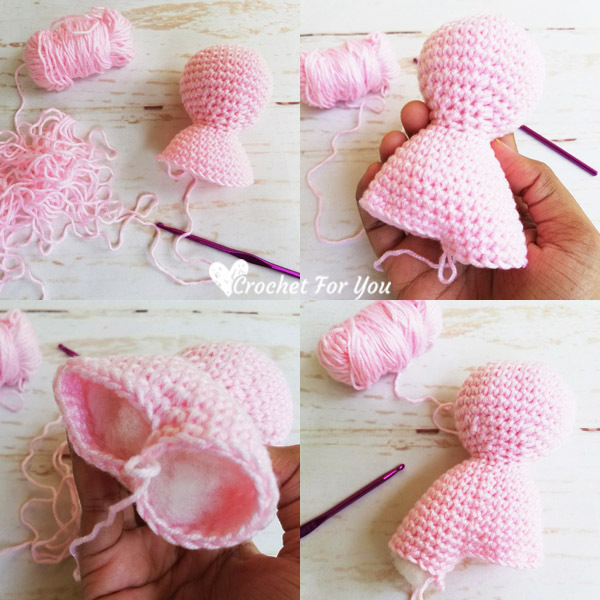 I have a little experience crocheting amigurumi. 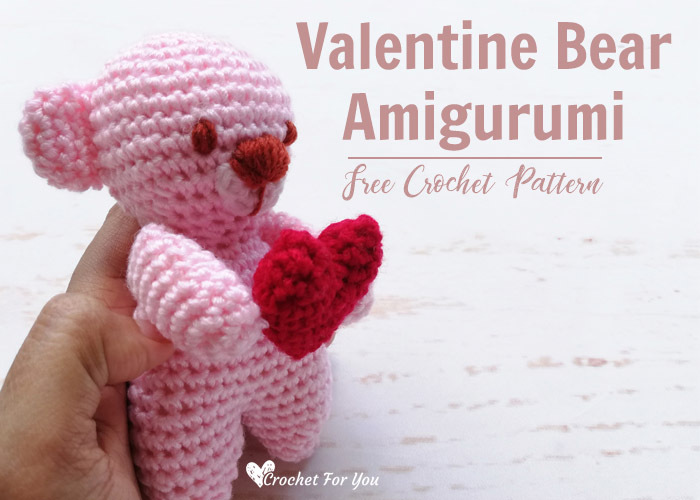 The Heart Angel I shared last week want me to make more amigurumi patterns. 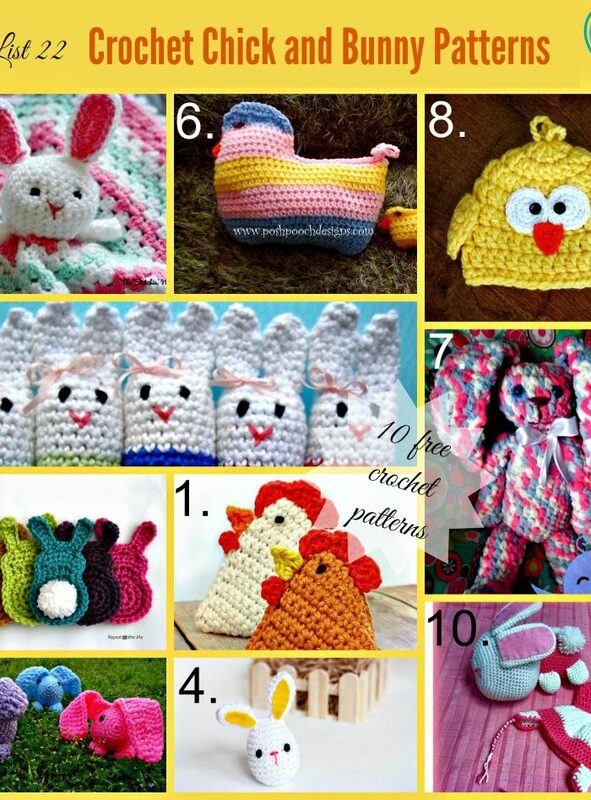 I have shared lots of ragdoll style crochet amigurumi patterns. They are simple shaped, stuffed flat and two-dimensional softies. You can check out my Spring Chick and the Christmas Ornaments I made for last 2 CAL’s. 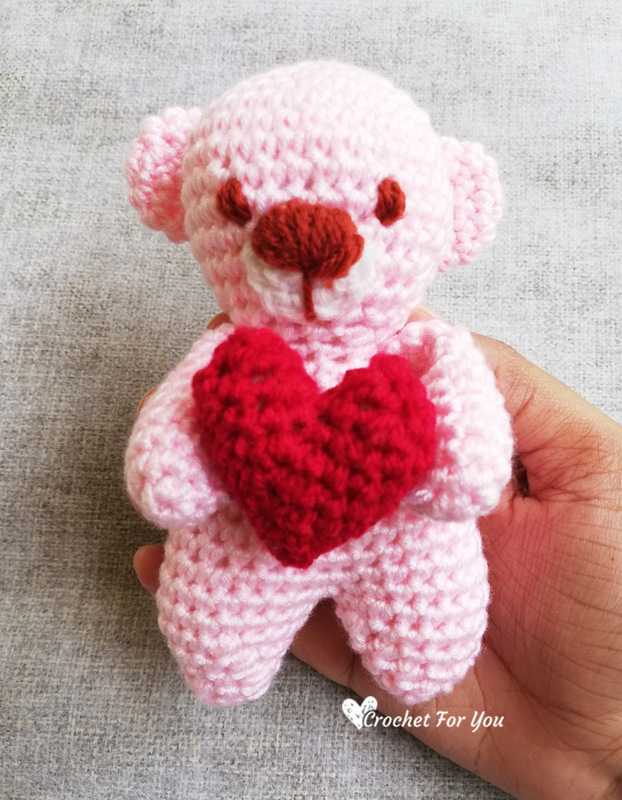 I hope you love this cute little Valentine Bear. 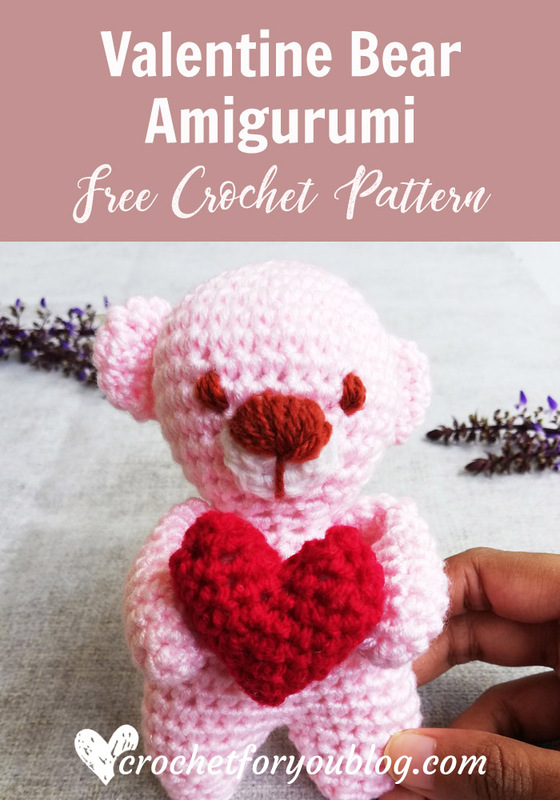 If you haven’t tried yet to crochet amigurumi, but you really want, I have included lots of step by step photos for this pattern. 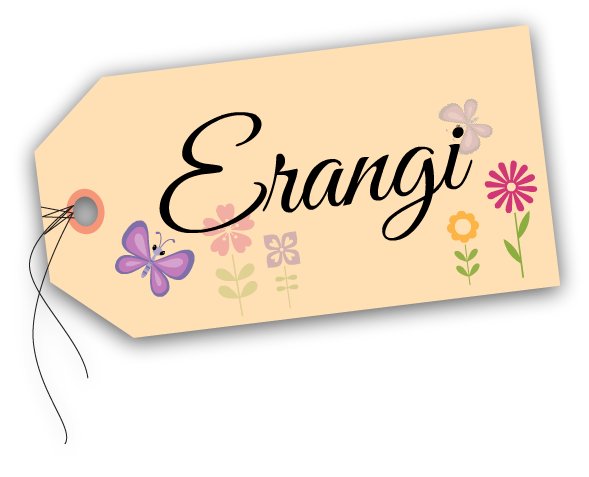 Disclosure This blog may contain affiliate links. 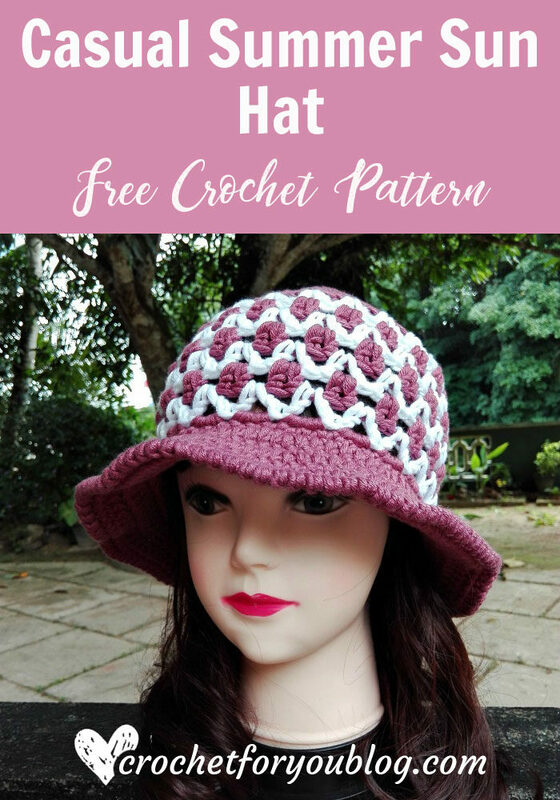 sc inc = crochet 2 sc in same st.
Each round start in the first stitch. Round 14: ch 1, [sc dec, sc in each of next 2 sts] 6 times, sl st to the first st. (18 sts) Add fiberfill. Round 23 to 25: ch 1, repeat round 22. Round 26: ch 1, [sc inc, sc in each of next 4 sts] 6 times, sl st to the first st. (36 sts) Add fiberfill. Round 32: ch 1, [sc dec, 1 sc] 3 times, sl st to the first st. (3 sts) Add fiberfill. Fasten off and cut the yarn leaving about 8″ long yarn tail. Start from the first st of skipped sts. Join the yarn, repeat rounds 27 to 32. Fasten off and cut the yarn leaving about 8″ long yarn tail. Round 5 to 11: repeat round 4. Add fiberfill lightly. stuff only half way. Round 12: ch 1, start from the first st, sc dec around, sl st to the first st. (9 sts) Fasten off and cut the yarn leaving about 8″ long yarn tail. Round 4: repeat round 3. Fasten off and cut the yarn leaving about 8″ long yarn tail. 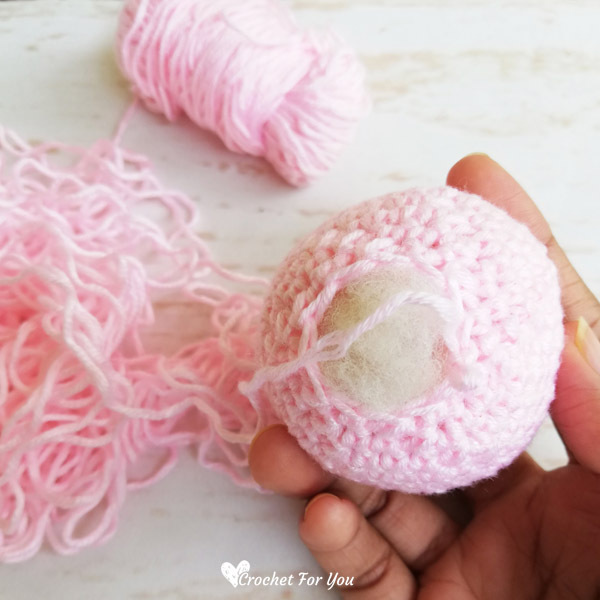 Make an adjustable/magic ring with white yarn. Round 2: ch 1, 2 sc in each st around, sl st to the first st. (12 sts) Fasten off and cut the yarn leaving about 8″ long yarn tail. Embroider short straight lines above the snout for eyes. 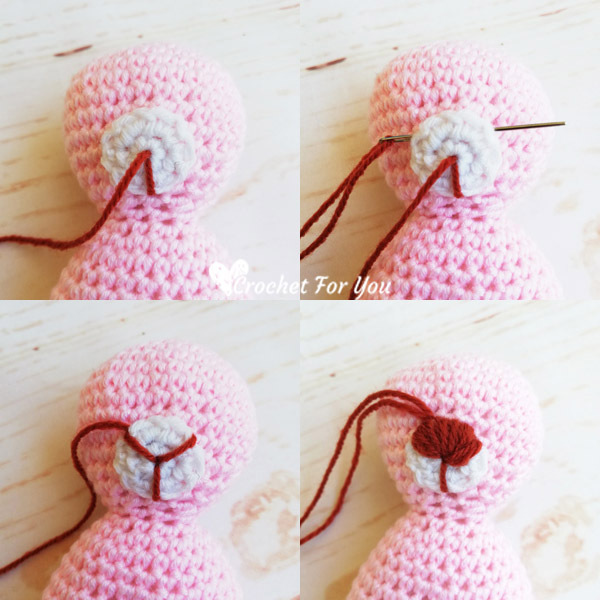 Sew each ear on 2 sides on the head between 5 and 10 rounds using yarn tails. 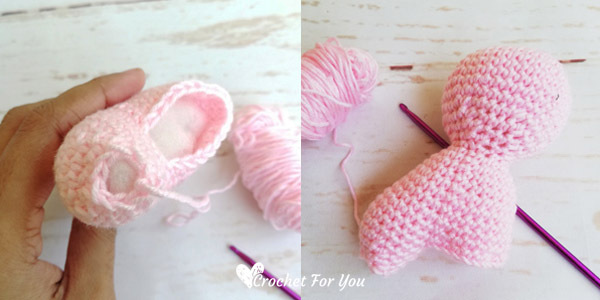 Click here to go to the Crochet Heart Angle Pattern page, and follow the Heart pattern only. Attach the heart to the arms. I fell in love with this little one and tried to chroset it but unfortunately I did not quit understand the pattern. After makeing the head there come the legs How to make the body ? Ohh.. Thank you so much Mirja for letting me know about this. It was a huge mistake. 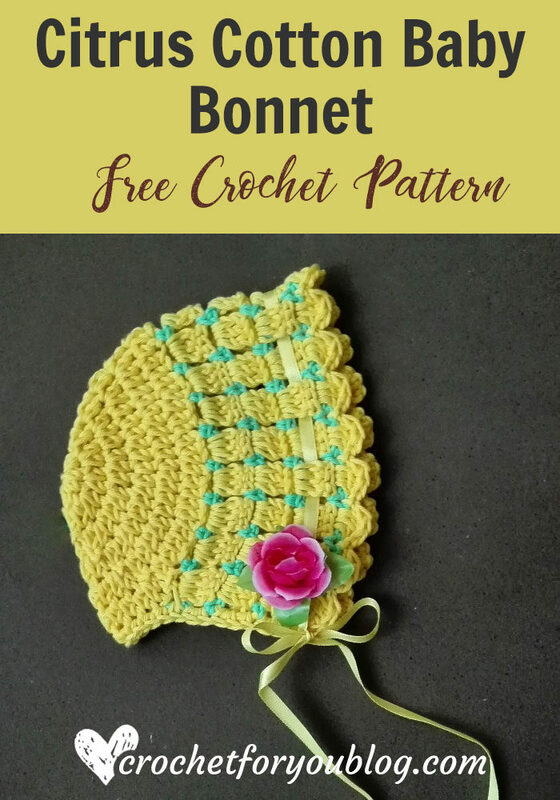 I just fixed and updated the pattern. I’m so sorry. Hope you will continue the pattern from where you stopped. Thank you again!